Honeybees are being threatened by tiny flies that lead them to lurch and stagger around like zombies. The afflicted bees often make uncharacteristic night flights. They sometimes buzz around porch lights before dying. Well-documented on the West Coast, some zombie-bee cases also have been detected in eastern states. They were found by volunteers helping track its spread. This comes as honeybees have already been ravaged in recent years by mysterious colony collapse disorder, vampire mites and nutritional deficiencies. 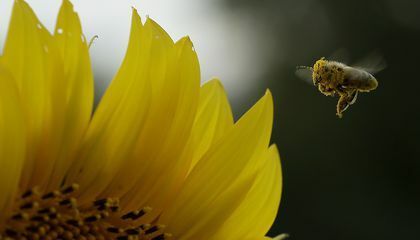 "We're not making a case that this is the doomsday bug for bees," said John Hafernik. He is a biology professor at San Francisco State University. "But it is certainly an interesting situation where we have a parasite that seems to affect the behavior of bees and has them essentially abandoning their hive." In 2012 Hafernik started a project to enlist people to track the spread of zombie bees. It is called ZomBee Watch. Participants are asked to upload photos of the bees they collect and photos of pupae and adult flies as they emerge. They have more than 100 confirmed cases. The fly had already been known to afflict bumblebees and yellow jackets. Then in 2008, Hafernik made a discovery. He had scooped up some disoriented bees beneath a light outside his campus office. Before long, he noticed pupae emerging from a bee. That led to the first of many zombie honeybee cases found in the San Francisco area and beyond. Researchers believe Apocephalus borealis flies attack bees as they forage. The flies pierce the bees' abdomens. Then the flies deposit eggs. That affects the behavior of the doomed bees. A beekeeper in Burlington, Vermont, detected the first zombie case in the East. That was in 2013. Then this summer, amateur beekeeper Joe Naughton of Hurley, New York, discovered the first of two recently confirmed cases. He found them in the Hudson Valley, north of New York City. Naughton, who has 200,000 or more bees, is not panicking just yet. "You know, the 'zombie' thing is a little bit sensational and some people hear that and they go right into alarm bells ringing," Naughton said. "Where the state of things are right now is mostly just fact finding." And there are a lot of facts to find. It's possible that zombie watchers like Naughton are just now detecting a parasite that has been targeting honeybees for a long time. But Hafernik notes that reports of honeybees swarming night lights are a recent occurrence. 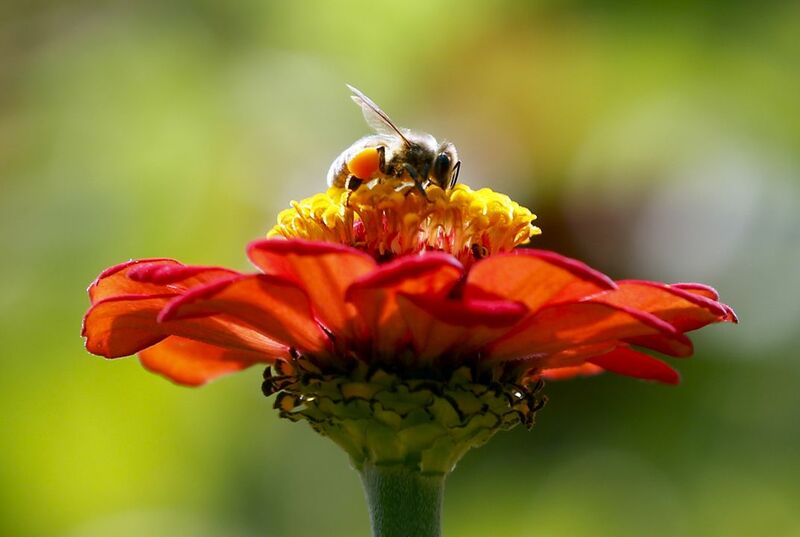 It's not clear if zombie bees can be linked to colony collapse disorder. It is a syndrome in which whole colonies fail after the loss of adult worker bees. Scientists have not been able to prove what causes CCD. Some believe it could be an interplay of factors including mites, pesticides and habitat loss. For now, threats like mites are more of a concern to researchers than the spread of zombie fly parasites. "We have several other stresses on bees. And we don't want any other stress like this one," said Ramesh Sagili. He is an assistant professor of apiculture at Oregon State University. "We have to be cautious. But I'm not alarmed that this parasite is going to create a big problem." Would you like to fly upside down? Why is it better to focus on facts rather than panicking? This is amazing, yet tragic. Seeing all the things that can happen in the nature world, included zombie bees, just shows how complex the Earth is. I wonder what the flies, that have caused the zombie effect on the bees after laying eggs in them, could do or have done to humans. You never know, the next time someone gets stung by a bee they could have some zombie side effects. That'd be just grand. The zombie apocalypse caused by bees. Yep. So, the flies are the problems? If it is, we should all destroy the flies because right now the flies are making the honeybees into zombies, and flies always annoys us and bugs us when we eat. Flies are the problems in the worlds. But, we need flies, than what shall we do? Should we kill half of the flies because it is keep producing flies. We should have more frogs in out house, so the frogs could eat them. It is better to focus on facts before panicking because like Naughton said,"the whole 'zombie' thing is a little bit sensational and some people hear that and they go right into alarm bells ringing." I was really interested in this article because I am a really big fan of The Walking Dead series. It's better to focus on the facts before panicking because Naughton said "the 'zombie' thing is a little bit sensational and some people hear that and they go right into alarm bells ringing,"
Well the more you know about the Zombees is the better because you never know they just not harm humans only other bugs. If you panic then you will be worried and if their were to (let's just say ) take over the "world" the you just want to look into facts about the Zombees to learn maybe how to "kill" them. They want to find out whats wrong with the bees and focus on stats.I think that they should not panic then focus on stats. 2. I think the ZomBee Watchers club is a great way to teach people about bees, it's also great because I personally would n=ot want to wake up one morning and have a bunch of bees dead outside my front door. I've heard about huge groups of bees dying randomly but a parasite taking over and effecting the behavior is something that I've never heard of. That is a very interesting article. The poor bees that are affected by this.